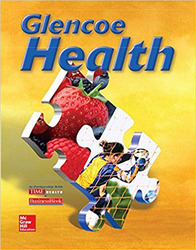 Glencoe Health builds health skills, builds fit and active teens, and builds a healthy generation. Builds health skills with hands-on activities and real-world examples embedded throughout the text. Builds fit and active students with in-depth fitness and nutrition information including Glencoe's exclusive Fitness Zone. Builds a Healthy Generation with the latest technology resources including StudentWorks Plus DVD, TeacherWorks Plus DVD, PowerPoint DVD, ExamView Assessment Suite CD-ROM, and Glencoe Health's Online Learning Center. Flexible, skills-based videos at your fingertips for every lesson with Glencoe's Health eSpotlight Video Series. The videos empower you to launch a discussion, enrich student learning, preview chapter and lesson content, or teach health skills.